“TODAY THE WORLD IS DIVIDED INTO TWO HALVES, THE OPPRESSORS AND THE OPPRESSED. 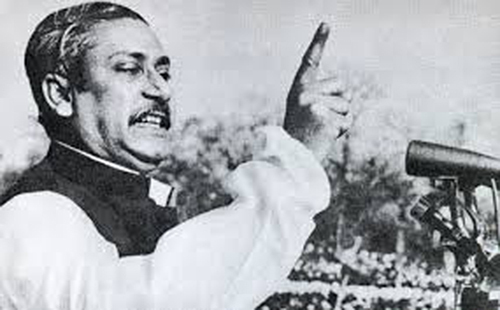 We set out to tell the story of a momentous and inspirational event in Bangladesh’s history: the speech of Bangabandhu Sheikh Mujibur Rahman on 7th March 1971. Our aim is to promote justice, equality, freedom and friendship amongst all regardless of race, religion, gender and geographical locations, by highlighting the significance of this historic event and the life and work of its leader Sheikh Mujibur Rahman – the founding father of the independent and secular People’s Republic of Bangladesh. To take our aims and objectives forward we would like to create a platform of cultural exchange for the global community where ideas and experiences can be shared for promoting justice, equalities, freedom and friendship through research, seminars, conferences, films, publications, exhibitions and education. “The struggle this time is the struggle for our emancipation.